Pavers are popular hardscaping tools, especially during the cold, winter months. They come in a wide range of sizes, shapes and colors and also work well for everything from water features to driveways to winding garden paths. Going green between patio pavers is a sustainable landscape practice, as well as an attractive way to add natural beauty to your hardscape. 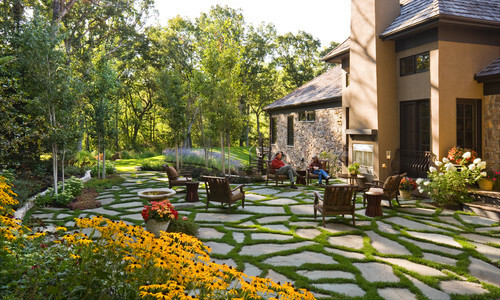 The following examples show how balancing solid pavers and green space can enhance backyard designs. Water conservation is all well and good until you crave the feeling of green grass beneath bare feet on a warm summer’s day. 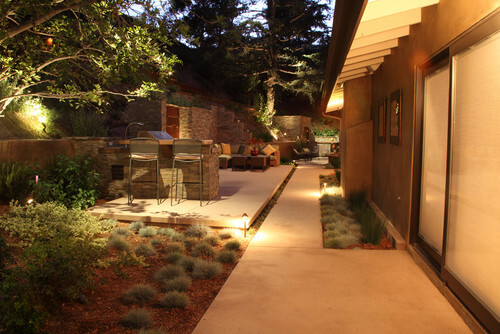 By using large flat pavers, with generous space in between, you can design a “pseudo-lawn” area in your backyard. 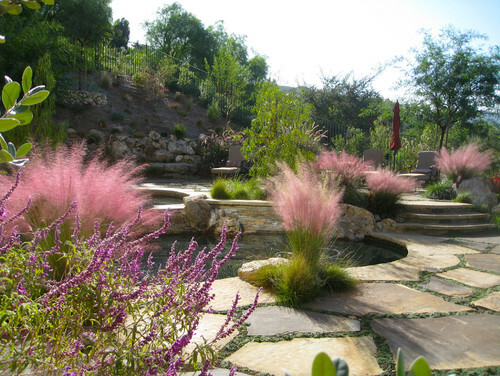 The space will require significantly less water than a traditional lawn, but will still provide the essence of a green area. A water feature appears more integrated with the landscape when surrounded by natural stone pavers bordered with greenery. Grass isn’t your only option between pavers. A drought-resistant alternative that grows well in Colorado, Dymondia margaretae, will add a lovely green and silver accent, as well as texture. It forms a weed barrier, grows quickly and is soft on the feet. For areas where ground cover is more fragile, we recommend installing your pavers flush with the ground. In addition to providing sound footing, they’ll be low enough to avoid nicking lawnmower blades. They are also much less of a trip hazard. If you’re planning on installing a solid patio or walkway slabs, use drought-resistant ground cover to form attractive borders and interruptions. Aesthetic improvement isn’t the only goal. These areas form a more permeable surface, allowing valuable water runoff to return to the ground where it’s needed. Contact our team at Lifescape Colorado if you want to go green between your pavers. 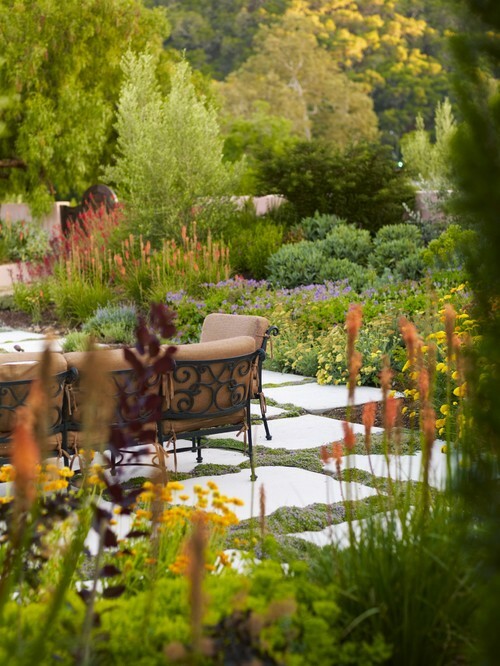 We provide Colorado hardscape services in addition to landscape design and year-round maintenance.